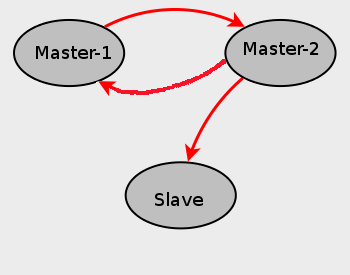 * Let me inform you all that Multi Master replication in MySQL is purely based on following two variables. It has nothing to do with replication technology used in MySQL replication…. log-slave-updates => Slave server does not log to its own binary log any updates that are received from a Master server. This option tells the slave to log the updates performed by its SQL thread to its own binary log. * So we all learned to configure multi-master MySQL replication. Enjoy!! Talend Open Studio operates as a code generator allowing data transformation scripts and underlying programs to be generated either in Perl or in Java. Its GUI is made of a metadata repository and a graphical designer. The jobs are designed using graphical components, for transformation, connectivity or other operations. The threads created can be executed from within the studio or as standalone scripts. CloverETL is a Java-based data integration framework used to transform, cleanse, standardize and distribute data to applications, databases or warehouses. Its component-based structure allows easy customization and embeddability. * CloverETL Designer – the graphical user interface to create and modify data transformations for CloverETL Server and Engine. * CloverETL Engine – executes the transformations (run-time); can be embedded as a library. Available under LGPL. * CloverETL Server – full-fledged server application with a rich WEB-based administrative interface, which leverages the existing CloverETL Engine. The Pentaho BI Project is Open Source application software for enterprise reporting, analysis, dashboard, data mining, workflow and ETL capabilities for Business Intelligence (BI) needs. Apatar is an open source ETL (Extract-Transform-Load) and mashup data integration software application. Other open source data integration projects are Clover.ETL, Pentaho Project, Talend Open Studio or Enhydra Octopus. Partitioning is available in Oracle since 8i (few feature or type) version but in MySQL it is available after 5.1 version. Partitioning allows you to distribute portions of table across a file system (physically at different location). User can define the partitioning of table so that some portion of table can stored at different physical location…. Table is structure which has columns and rows. Partitioning can be applied to rows or volumes. * Horizontal partitioning ~ Storing different rows of table to different physical location is called as horizontal partitioning of table. * Vertical partitioning ~ Storing different columns of table to different physical location is called as vertical partitioning of table. MySQL supports only support “Horizontal partitioning” !! 1] How to check whether MySQL installed on your system supports ‘partitioning’ ? * Check ‘partition’ plugin is installed or not… ? * Check above output. If you don’t see ‘partition’ entry in above query. Then MySQL version does not support partitioning. If it entry exist then check “have_partitioning” system variable is set to ‘YES’ or not…. 2] Which storage engines (table type) supports partitioning? MySQL partitioning engine runs in a separate layer and can interact with any of storage engine. So we can use most of the storage engine as backend/table type to store data. Note we must use same storage engine for all partitions of table. NOTE ~ In any type of partitioning – partitions are always numbered automatically and in sequence starting with 0. When a new row is inserted into a partitioned table, these partition numbers that are used in identifying the correct partition. Also partition names are not case-sensitive. Number of partitions for the table, this must be expressed as a positive, non-zero integer literal with no leading zeroes, and may not be an expression. MAXVALUE ~ It is an integer value that is always greater than the largest possible integer value (least upper limit). <= 50 then row will go to p1 partition and so on ..
** Let’s us check the physical location of database…. ** What if ‘country_id’ value NOT matching with lists values ? D] KEY Partitioning ~ It is similar to partitioning by hash, except that where hash partitioning employs a user-defined expression. It is also known as composite partitioning in which partition is divided in to sub partition. Use SUBPARTITION clauses while creating table. Oracle Database is widely used commercial Database on Unix/Linux and Windows platform…. This article explain the step by step installation of Oracle 10g Release 2.0 on Ubuntu 8.04111!! Make sure that following packages are installed on your system!! NOTE – “oinstall” should be primary group of oracle user. It is not necessary to use “oracle” as username, you can name but make sure that the “oinstall” is primary group of that user!! Update /etc/security/limits.conf file as shown below…. In between installation you need to run following shell scripts as root user….. The following J2EE Applications have been deployed and are accessible at the URLs listed below. TIMESTAMP DEFAULT :- in this when new row get inserted or existing row get updated that time current timestamp get inserted. CURRENT_TIMESTAMP :- in this when row get inserted that time current timestamp get inserted.no change on update. ON UPDATE CURRENT_TIMESTAMP :- when row get affected that time current timestamp get inserted. when you loss mysql root pasword. then stop mysql server.. then follow below steps. 071129 9:41:39 [Note] mysqld: ready for connections. GreenSQL is an Open Source database firewall used to protect databases from SQL injection attacks. GreenSQL works in a proxy mode and has built in support for MySQL. The logic is based on evaluation of SQL commands using a risk scoring matrix as well as blocking known db administrative commands (DROP, CREATE, etc). GreenSQL is distributed under the GPL license. Blocking administrative and sensitive SQL commands. Calculating risk of each query and blocking queries with high risk. GreenSQL uses a pattern matching engine to find commands that are considered “illegal“. For example GreenSQL blocks database administrative commands. The GreenSQL administrator can decide which commands to block using the GreenSQL web management console. The administrator can also approve a blocked query by adding them to a whitelist. When GreenSQL determines that a query should be blocked it will generate an empty result set to send back to the front end so that the application can continue gracefully. Each time GreenSQL considers a SQL query as a security risk – it is blocked. You can alter this behavior for a specific query by explicitly allowing its pattern. What is a GreenSQL Listener? A GreenSQL Listener object is the heart of the GreenSQL Databae Firewall. A Listener is a proxy object used to connect queries from the frontend to a specific backend server. Before passing the query to the backend it is checked by the Listener to determine if it is malicious and if so how it should be handled (block, alert, pass). Introduction – The SQL so far is part of the standard that all SQL implementations. Now let’s about the most useful, but most difficult areas of SQL – built-in SQL functions. Like most computer languages, SQL includes the capability to perform functions on data. However, each database vendor has implemented their own set of functions. Not only does each vendor choose which functions they will support, different vendors implement the same functionality using different syntax! This basically means that as soon as you open the door to functions, your database code stops being portable. For traditional database applications, that is less of an issue, but for web-based applications using tools like PHP, it means that the SQL functions you embedded in your web application will break when you move from MySQL to Oracle or to SQL-Server. To make matters worse, SQL functions often provide significant performance gains for all sorts of database manipulation, particularly in the case of web applications. So what’s a we should to do? My advice is to use functions anywhere you can produce a measurable performance gain and document thoroughly what database the SQL was intended to work with. As we’ll talk about in a future column, moving any function-oriented code to a database stored procedure and essentially “black-boxing” it is an excellent approach — this lets the DBA rewrite the stored procedures for optimal performance — but some databases do not support stored procedures, so this is not a perfect solution. There are a number of functions that are available in a wide range of databases, so you can usually get the functionality you need as long as the functions are not too exotic. 4) System functions – for returning database-specific information (such as a username). How do you know what functions your database supports? Unfortunately, the only reliable way is to check the documentation. As a general rule of thumb, the more a database costs (or the more widely it is used for open source databases), the more functions it supports. Functions open up a huge range of additional functionality for SQL developers, but at the cost of portability between database platforms. However, functions provide improved functionality and performance for data-intensive applications.